The Labyrinth journey has been used for hundreds of years as a walking prayer/meditation. There is no wrong way to use the labyrinth. Picture walking a path that has 36 turns as you make your way to the center. Think of all the things you can let go of every time you turn. It is an amazing walk to the center where you are held in the safety of Love. It is a powerful thing to walk the labyrinth and find yourself at home. You may stay in the center as long as you need. And then you walk out the same path, turning 36 more times as you take on all that you have learned. We have made this experience possible for you to prepare your heart, soul and mind to experience Easter in a new way. RUCC is hosting an Earth Day INDOOR Flea Market on Saturday, April 22nd. We have over 30 vendors selling amazing products! There will be everything from wine and lunch bags to art and collectibles! Free range, no antibiotics, non-gmo, organically fed pickled eggs to yard crafts! Herbalife to organic personal care products! Hand turned wood and acrylic creations to Norwex! Handmade ceramic coasters to sports equipment! Custom handmade jewelry to Beanie Babies! Vintage clothing to handmade home accents and decor! Smart Women household products to Lipsense SeneGence Skin Care products! Homemade jams and jellies to kids clothes and toys! Up-cycled jewelry to a roomful of household items! Yard dice/games to Wildtree products! Younique beauty products to handmade work tables! Bottle cap earrings to starter plants! Premier Designs Jewelry to an American Girl doll! Table centerpieces to Equal Exchange Fair Trade coffee and chocolate! Handcrafted body care products to custom buttons and bag! There will even be a musician for your listening pleasure! Come hear Brian Peterson. Our youth group will be selling chili, nachos, and popcorn to raise money for their upcoming mission trip to Heifer International. Our Pilgrim Guild will be selling desserts. Yum! You’ll never know what you’ll find!! Come early. Bring friends. Make a day of it. You won’t be disappointed. Yes, MOVEMENT is indeed what is happening in our Conference when it comes to providing “Sanctuary” for immigrant families facing deportation. The Sanctuary Movement traces its roots to the 1980s, when many congregations were led to provide housing and other assistance to Central American refugees who were being denied asylum by the United States. Today the movement is experiencing a resurgence. In 2016, 400 congregations of various traditions were “sanctuary congregations”; since the Presidential election, that number has increased to 800 nationwide. UCC congregations participating in the movement have gone from 15 last year to 50 most recently. Rev. 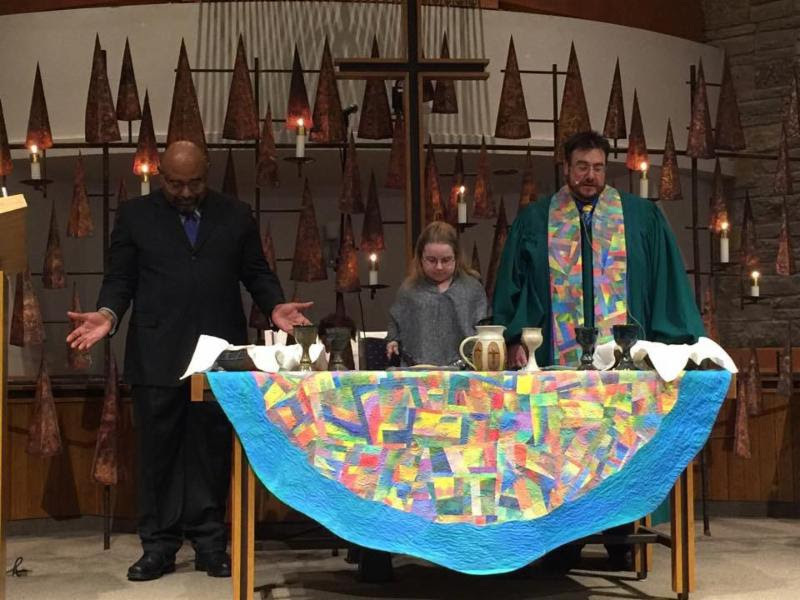 T. Michael Rock of Robbinsdale UCC says: We became a Sanctuary Congregation in December 2014. We took this leap of faith with the support of Rev. John Gutterman and the MN Conference Immigration Team. We heard the stories of two families in our congregation who lived through a deportation experience and we vowed to do what we could as a congregation to not let that happen again. We feel blessed with many resources and relationships and feel that becoming a Sanctuary Congregation was central to our faith and understanding as people of Radical Hospitality in the United Church of Christ. know what White Privilege is all about? want to engage in a dialogue that isn’t about guilt? want to work for racial equity? We will provide a safe space for exploring these topics. Our guide will be the curriculum from United Church of Christ, White Privilege: Let’s Talk (free download).